Cell growth and accumulation of polyhydroxybutyric acid, P(3HB), from CO2 in autotrophic condition of a newly isolated hydrogen-oxidizing bacterium, the strain O-1, was investigated. The bacterium, which was deposited in the Japan Collection of Microorganisms as JCM17105, autotrophically grows by assimilating H2, O2, and CO2 as substrate. 16S rRNA gene sequence of the bacterium was the closest to Ideonella dechloratans (99%). 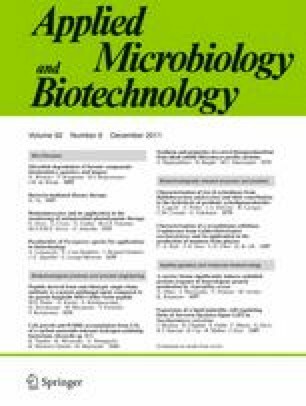 Specific growth rate of the strain O-1 was faster than a hydrogen-oxidizing bacterium, Ralstonia eutropha, which is well-known P(3HB)-producing microorganism. The strain O-1 is tolerant to high O2 concentration and it can grow above 30% (v/v) O2, while the growth of R. eutropha and Alcaligenes latus was seriously inhibited. In culture medium containing 1 g/L (NH4)2SO4, cell concentration of the strain O-1 and P(3HB) increased to 6.75 and 5.26 g/L, respectively. The content of P(3HB) in the cells was 77.9% (w/w). The strain O-1 was very tolerant to carbon monoxide (CO) and it grew even at 70% (v/v) CO, while the growth of R. eutropha and A. latus were seriously inhibited at 5% (v/v) CO. From these results, it is expected that the strain O-1 will be useful in the manufacture of P(3HB) because the industrial exhaust gas containing CO2, H2, and CO can be directly used as the substrate in the fermentation process. A part of this study was supported by a scientific grant from JFE Steel Corporation, Japan.